Mycotoxins are toxic metabolites produced by certain fungi that infect corn kernels. These mycotoxins can result in illness when ingested by animals and humans. Mycotoxin contamination commonly occurs in corn grown in the southeastern United States and occurs in some cornfields in North Carolina every season. Corn growers must be aware of the potential for mycotoxin contamination and take steps to avoid or reduce its occurrence. For more information on management of mycotoxin contamination in corn, visit www.corntoxins.org. Two mycotoxins commonly associated with corn are aflatoxin and fumonisin. Species of Aspergillus produce aflatoxin, while species of Fusarium produce fumonisin. Both of these fungi cause ear and kernel rots in corn. Aflatoxin contamination has been a known problem for decades in the United States. In 1969, the Food and Drug Administration (FDA) set the action level for aflatoxin at 20 parts per billion (ppb) for human consumption (FDA 2009). In farm animals, chronic exposure to aflatoxins compromises immunity, interferes with protein metabolism, reduces weight gain, and can lead to hemorrhaging (CAST 2003). Large doses lead to acute illness and death in animals and humans. Furthermore, all doses of aflatoxin have a cumulative effect on the risk of cancer (CAST 2003; FDA 2012). Fumonisin contamination is more of a recent problem in corn. In 2001, the FDA recommended that there be no more than 4 parts per million (ppm) of fumonisin in food for human consumption (FDA 2001). Consuming fumonisin-contaminated grain has been associated with a higher risk of esophageal cancer and neural tube birth defects in humans (Marasas et al. 2004). The two farm animals most sensitive to fumonisin are horses and swine. Fumonisin causes leucoencephalomalacia in horses and pulmonary edema in swine (CAST 2003). For more information on guidance levels of mycotoxins in livestock feed, visit the National Corn Growers Association website. Because of the health and economic consequences of mycotoxin contamination, it is imperative to use reliable contamination control methods. Three strategies to manage mycotoxigenic fungi include the use of fungicides, biocontrol agents, and Bt hybrids. Several fungicides are labeled for corn and may be potentially useful in controlling Aspergillus and Fusarium species. In this publication, we examine three fungicides—Headline, Quilt Xcel, and Stratego YLD—for their ability to reduce mycotoxin contamination in corn. Headline, a BASF fungicide, is used to control anthracnose, gray leaf spot, northern and southern corn leaf blight, rust, and a few other fungal diseases (BASF 2014). Quilt Xcel, a Syngenta Crop Protection fungicide, is used to control anthracnose, gray leaf spot, Diplodia ear rot, northern and southern corn leaf blights, and other fungal diseases (Syngenta 2014). Stratego YLD, a Bayer CropScience fungicide, is mainly used to control gray leaf spot, rusts, anthracnose, northern and southern corn leaf blight, and brown spot of corn (Bayer CropScience 2014). None of these fungicides had been previously tested for control of Aspergillus or Fusarium (BASF 2014; Syngenta 2014; Bayer CropScience 2014). Two biocontrol products, AF36 and Afla-Guard®, are currently labeled for use on corn, but only Afla-Guard® is registered for use in North Carolina. Afla-Guard® and AF36 each contain a nonaflatoxigenic strain of Aspergillus flavus (A. flavus) that reduces aflatoxin contamination via competitive exclusion of toxigenic strains of A. flavus (Yin et. al. 2008). AF36 is produced by the Arizona Cotton Research and Protection Council (Isakeit 2011), and the carrier formulation is heat-killed wheat seed colonized by the nonaflatoxigenic strain of A. flavus. Afla-Guard® is a Syngenta Crop Protection product. The carrier formulation is hulled barley seeds coated with nonaflatoxigenic strains of A. flavus (Isakeit 2011). Both biocontrol products were used in this study to determine the best timing and rate of application to reduce mycotoxin contamination. Genetically modified maize has been grown in the United States since 1995. One of the first genetically modified traits was the expression of proteins from Bt (Bacillus thuringiensis) in corn hybrids (University of California, San Diego). Bt is a bacterium whose proteins are poisonous to insects. Bt hybrid corn expresses these genes, therefore producing the proteins and thus controlling insect damage. Current Bt transgenic events are effective in controlling corn borers (Ostrinia nubilalis) and corn earworm (Helicoverpa zea), which can damage both the stalk and the ear. Corn borers and corn earworms create entry points in stalks and kernels for other detrimental microorganisms, such as toxigenic fungi. Therefore, not only does Bt reduce damage by the insects themselves, it also reduces the amount of secondary damage from disease causing organisms. There are three common Bt products on the market. Yield Guard, a Monsanto product, was one of the earliest Bt proteins available. It is very effective in controlling corn borer but only moderately effective in controlling corn earworm. Herculex, a DuPont product, is very effective on corn borer but has no effect on corn earworm. Viptera, a Syngenta product, is the newest type of Bt product. Viptera has two types of proteins that bind to insects’ mid-gut membranes. Viptera is very effective in controlling both corn borer and earworm, and it can also control rootworms, cutworms, and armyworms (Syngenta 2011). Three fungicides (Headline, Quilt Excel, and Stratego YLD) were tested either alone or in combination with a biocontrol agent for their efficacy in reducing mycotoxin contamination in corn. Headline-treated corn plants had lower aflatoxin contamination than plants treated with Quilt Xcel or Stratego YLD (7.8 versus 8.9 ppb). Aflatoxin contamination was too low (<2.5 ppb) in experiments designed to determine if there was a significant difference between using a biocontrol or not in partner with fungicides. Quilt Xcel and Stratego YLD had a greater impact on reducing fumonisin levels (0.16 and 0.21 ppm, respectively) than did Headline (0.41 ppm). Overall, the levels of aflatoxin and fumonisin observed in this study were below the FDA guidelines for human or animal consumption. Yield was affected by use of fungicides. Quilt Xcel had the highest yield of 185 bushels per acre (bu/acre) compared to Headline (154 bu/acre), Stratego YLD (161 bu/acre), and the non-treated control (139 bu/acre) (Figure 1). For control of mycotoxins, Headline would be the preferred fungicide because it resulted in the lowest aflatoxin contamination and roughly the same fumonisin contamination as the other fungicides. Since mycotoxin levels in this study were low, more research is needed to confirm the advantage of using Headline to reduce mycotoxin contamination. 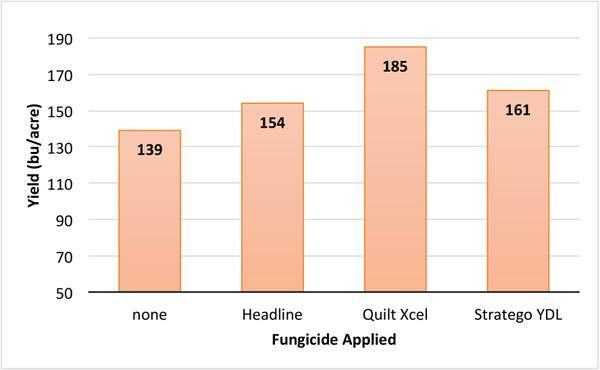 Although Quilt Xcel produced the greatest yield, all the fungicides increased yield compared to the non-treated control. Figure 1. Average yield for each applied fungicide. The control group—no fungicide—serves as comparison. Afla-Guard® and AF36 were applied at V5 (five fully developed leaves) or VT (50% tassel emergence) with rates of 2.5, 5, 7.5, or 10 pounds per acre (lb/acre). Fumonisin and aflatoxin contamination and yield were taken to measure performance of applied biocontrols. Yield and mycotoxin levels also were recorded for non-treated controls to serve as background information. The use of the biocontrol agents Afla-Guard® and AF36 reduced levels of aflatoxin and fumonisin contamination slightly more than the non-treated control. Afla-Guard® slightly reduced fumonisin levels (0.28 ppm), but these levels were not significantly different than the non-treated control (0.32 ppm). There was a very small difference between using Afla-Guard® or AF36. In regard to aflatoxin contamination, AF36 had slightly lower levels than Afla-Guard®. Due to low levels of fumonisin contamination (< 0.2 ppm), it was not possible to fully evaluate differences between the biocontrol products applied in reducing fumonisin contamination. 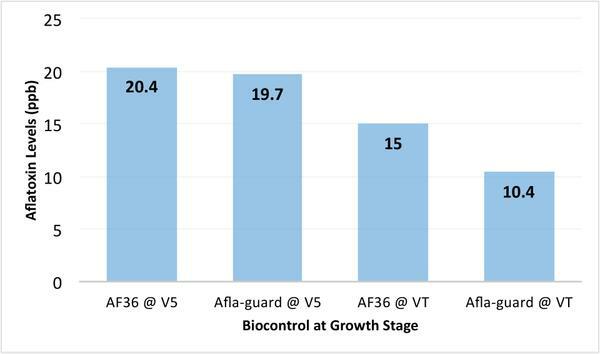 AF36 had slightly higher yield compared to Afla-Guard® when applied at either V5 or VT. Application timing did not affect the efficacy of either biocontrol. There were no significant differences in aflatoxin or fumonisin levels when either AF36 or Afla-Guard® were applied at V5 compared to an application at VT (Figure 2). Considering both biocontrols target Aspergillus, the lack of a reduction in fumonisin contamination from either a V5 or a VT application was expected. The highest yield of 169 bu/acre occurred when AF36 was applied at V5. The yields for the other three treatments—AF36 at VT, Afla-Guard® at V5, and Afla-Guard® at VT—were 153 bu/acre. Overall, application timing of either biocontrol had little effect on yield. The use of biocontrol products did not reduce mycotoxin contamination or increase yield when used in combination with fungicides. The rate at which either AF36 or Afla-Guard® was applied impacted aflatoxin contamination. The more biocontrol formulation that was applied to the field, the less aflatoxin contamination was present. The highest aflatoxin concentration (29 ppb) was found when 2.5 lb/acre of either biocontrol was applied. The lowest aflatoxin contamination was 8.1 ppb when 10 lb/acre of either biocontrol was applied (Figure 3). A 10 lb/acre rate is recommended for both of these biocontrol products at a cost of approximately $15 to $20 per acre for either AF36 or Afla-Guard® (including application costs). As was the case with the comparisons of timing and type of biocontrol, no significant differences in fumonisin levels were noted among rates of application. Rates of biocontrol applied did not affect yield. The most important consideration when using a biocontrol product is the application rate. 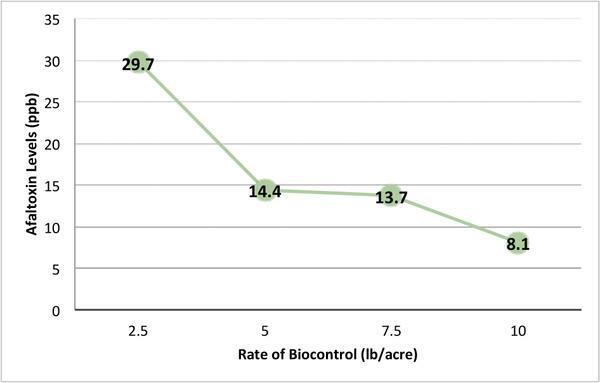 When applied at 7.5 or 10 lb/acre, both biocontrol products were effective in reducing aflatoxin contamination while maintaining yield. Applications at V5 were as effective as those at VT, which provides growers a wide window of opportunity to apply these products. Neither product had a significant impact on fumonisin contamination. Figure 2. Aflatoxin concentrations in response to timing of biocontrol application. Aflatoxin concentrations in ppb are shown above. Figure 3. Aflatoxin concentrations (ppb) in response to biocontrol application rate (lb/acre). 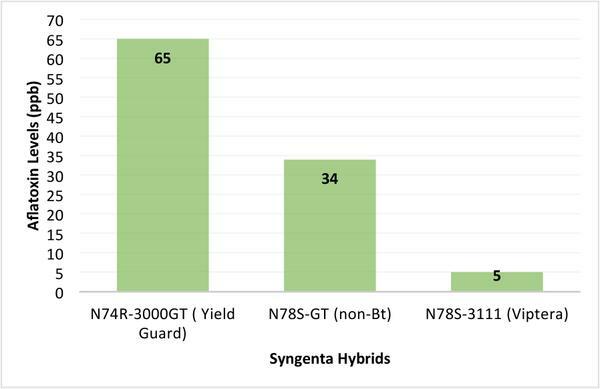 Three Syngenta hybrids were tested in this study: N74R-3000GT (Yield Guard), N78S-3111 (Viptera), and N78S-GT (non-Bt). The Syngenta hybrids were tested for performance and benefits against mycotoxin contamination. 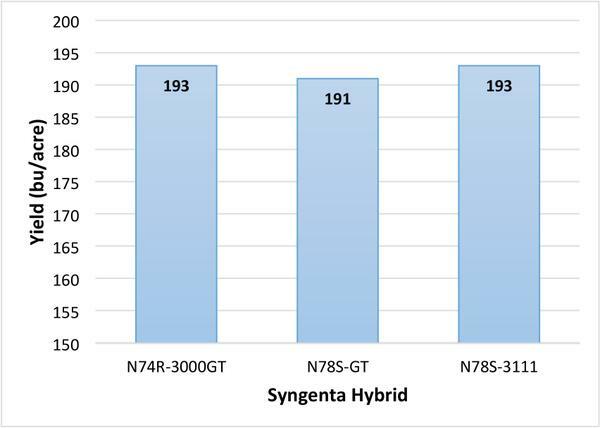 Syngenta N74R (Yield Guard) had the highest amount of aflatoxin contamination at 65 ppb; Syngenta N78S-3111 (Viptera) had the lowest aflatoxin contamination at about 5 ppb; and Syngenta N78S-GT (non Bt) was in between at 34 ppb (Figure 4). The most significant difference was between N74R (Yield Guard) and N78S-3111 (Viptera). Viptera has been shown to be much more effective in controlling earworm, and thus likely reduced aflatoxin contamination by restricting feeding by this insect. It was difficult to detect fumonisin contamination differences amongst hybrids due to the very low levels of fumonisin observed in the fields. Although there was no significant difference among the hybrids, N78S-3111 (Viptera) still had the lowest fumonisin contamination at 0.76 ppm compared with N74R, which had 1.2 ppm. There also was no significant yield difference amongst hybrids (Figure 5). N74R-3000GT (Yield Guard) yielded the same as N78S-3111 (Viptera) at 193 bu/acre. The lowest yield at 191 bu/acre was N78S-GT (non-Bt). The Viptera hybrid (N78S-3111) reduced aflatoxin contamination while maintaining yield. Viptera also had the lowest fumonisin contamination at 0.76 ppm, which is a level that is safe for consumption. Moreover, Viptera yielded the same as the other hybrids, which confirms that there is no yield penalty or trade-off. Therefore, this study suggests that corn producers could use Viptera hybrids for the reduction of aflatoxin (and fumonisin) while obtaining normal yields. Figure 4. Aflatoxin levels for each of the three Syngenta maize products tested. Figure 5. Hybrid effect on yield (bu/acre). BASF. 2012. Headline Product Label. Accessed June 24, 2014. BASF. 2014. Headline Fungicide Overview. Access June 24, 2014. BASF. 2008. Headline Fungicide Corn: Technical Information Bulletin. Accessed June 24, 2014. Bayer CropScience. 2014. Stratego YLD Overview. Accessed June 24, 2014. Bayer CropScience. 2014. Stratego YLD Product Label. Accessed June 24, 2014. CAST. 2003. Task Force Report 139. Mycotoxins: Risks in Plant, Animal, and Human Systems. Ames, Iowa. FDA. 2001. Guidance for Industry: Fumonisin Levels in Human Foods and Animal Feeds; Final Guidance. Accessed June 23, 2014. FDA. 2009. CPG Sec. 683.100 Action Levels for Aflatoxins in Animal Feed. Accessed June 23, 2014. FDA. 2012. Natural Toxins. In Bad Bug Book: Handbook of Foodborne Pathogenic Microorganisms and Natural Toxins. 2nd ed. 231-236. Accessed June 23, 2014. Isakeit, T. 2011. Prevention of Aflatoxin Contamination of Corn Using AF-36 or Afla-Guard. PLPA-FC004-2011. College Station, TX: Texas A&M AgriLife Extension. Marasas WF, Riley RT, Hendricks KA, et al. 2004. Fumonisins Disrupt Sphingolipid Metabolism, Folate Transport, and Neural Tube Development in Embryo Culture and in Vivo: A Potential Risk Factor for Human Neural Tube Defects among Populations Consuming Fumonisin-Contaminated Maize. J. Nutr. 134: 711–716. Syngenta. 2011. Agrisure Viptera 3111 (Agrisure Viptera Brochure Download). Accessed June 23, 2014. Syngenta. 2014. Quilt Xcel Product Label. Accessed June 24, 2014. University of California, San Diego. History of Bt. Accessed August 8, 2014. Yin et. al. 2008. Biological Control of Aflatoxin Contamination of Crops. Journal of Zhejiang University SCIENCE B. 9 (10): 787-792. doi: 10.1631/jzus.B0860003.